'''coreboot''' (formerly known as LinuxBIOS) is a Free Software project aimed at replacing the proprietary BIOS (firmware) you can find in most of today's computers. It performs just a little bit of hardware initialization and then executes a so-called [[Payloads|payload]]. Some of the many possible payloads are: a [[Linux]] kernel, [[FILO]], [[GRUB2]], [http://www.openbios.org/ OpenBIOS], [http://www.openbios.org/Open_Firmware Open Firmware], [http://www.openbios.org/SmartFirmware SmartFirmware], [http://www.gnu.org/software/gnufi/ GNUFI] (UEFI), [[Etherboot]], [[SeaBIOS]] (for booting Windows XP, Windows Vista, Windows 7, NetBSD and Linux), [[ADLO]] (for booting [http://en.wikipedia.org/wiki/Windows_2000 Windows 2000] and [http://openbsd.org/ OpenBSD]), [[Plan 9]], or [[memtest86]]. Some of the many possible payloads are: a [[Linux]] kernel, [[FILO]] (a GRUB-like bootloader for booting from disk), [[GRUB2]], [http://www.openbios.org/Open_Firmware Open Firmware], [[Etherboot]]/[[GPXE]], [[SeaBIOS]] (for booting Windows XP, Windows Vista, Windows 7, NetBSD and Linux), and [[Payloads|many others]]. coreboot with Linux as a [[Payloads|payload]] (other payloads are possible!) gunzip's the Linux kernel straight out of NVRAM and essentially requires no moving parts other than the fan. It does a minimal amount of hardware initialization before jumping to the kernel start and lets Linux do the rest. As a result, it is much faster (current record 3 seconds), which has sparked interest in the consumer electronics community as well. Moreover, updates can be performed over the network. coreboot with Linux as a [[Payloads|payload]] (other payloads are possible!) gunzip's the Linux kernel straight out of NVRAM and essentially requires no moving parts other than the CPU fan. It does a minimal amount of hardware initialization before jumping to the kernel start and lets Linux do the rest. As a result, it is much faster (current record: 3 seconds), which has sparked interest in the consumer electronics community as well. Moreover, updates can be performed over the network. Using a real operating system to boot another operating system provides much greater flexibility than using a simple netboot program or the BIOS. Because Linux is the boot mechanism, it can boot over standard Ethernet or over other interconnects such as Myrinet, Quadrics, or SCI. It can use SSH connections to load the kernel, or it can use the InterMezzo caching file system or traditional NFS. Cluster nodes can be as simple as they need to be perhaps as simple as a CPU and memory, no disk, no floppy, and no file system. The nodes will be much less autonomous thus making them easier to maintain. Using a real operating system to boot another operating system provides much greater flexibility than using a simple netboot program or the BIOS. Because Linux is the boot mechanism, it can boot over standard '''Ethernet''' or over other interconnects such as '''Myrinet''', '''Quadrics''', or '''SCI'''. It can use SSH connections to load the kernel, or it can use the '''InterMezzo caching file system''' or traditional '''NFS'''. Cluster nodes can be as simple as they need to be &mdash; perhaps as simple as a CPU and memory, no disk, no floppy, and no file system. The nodes will be much less autonomous thus making them easier to maintain. Some aspects of '''DRM''' are not travelling well with the idea of a free computer system. As many computer magazines already pointed out, there may be future restrictions imposed by BIOSes, that a customer is little aware of before purchase and might not harmonize with the idea of freedom and/or security in some cases. The coreboot project was started in the winter of 1999 in the Advanced Computing Laboratory at Los Alamos National Laboratory (LANL) by [[User:Rminnich|Ron Minnich]]. Two undergraduate students, James Hendricks and Dale Webster spent their winter vacation putting together the proof of concept implementation. The coreboot project was started in the winter of 1999 in the '''Advanced Computing Laboratory at Los Alamos National Laboratory (LANL)''' by [[User:Rminnich|Ron Minnich]]. Two undergraduate students, James Hendricks and Dale Webster spent their winter vacation putting together the proof of concept implementation. Since then, a [[Contributors|long list of people have contributed]] both in discussions and actual code. Please don't be shy and let us know if you are missing from the list. It's not a purposeful omission, just an unfortunate mistake. 4 Can I put coreboot into a PCI expansion ROM? It performs just a little bit of hardware initialization and then executes a so-called payload. See the Supported Motherboards page for which mainboards are supported, and also the list of Supported Chipsets and Devices. See the Products page for a list of vendors selling products running coreboot. Step 1: A very brief description of your system: CPU, northbridge, southbridge, mainboard and optionally other important details. Step 2: Linux lspci output for your system, generated by booting Linux via the original BIOS and runnning lspci. Step 3: Super I/O chip on the mainboard (report the model numbers on the actual chip, for example "Winbond W83627HF"). Step 4: Type of BIOS device (see the question "How do I identify the BIOS chip on my mainboard?" below). Usually in less than a day, someone will respond on the coreboot mailing list saying your mainboard is supported in the main coreboot source tree, it is currently in development, it is not yet supported or the manufacturer will not release information needed to provide coreboot support. In the latter case, please let the manufacturer know that you want coreboot support and his failure to release chipset information is making that very difficult. We have tested some of the BSD OSes and have seen, that FreeBSD for example makes BIOS calls, which is not supported by coreboot. Possibly with help of the tool ADLO, it may be possible to boot FreeBSD like it is now, but the right thing to do, is to remove FreeBSD's dependence on BIOS calls. It appears feasible, however, to introduce some "legacy support" to coreboot in the future to support OSes like the abovementioned. Update: SeaBIOS probably allows you to boot most modern operating systems. Simply test it and report to the coreboot mailing list. Test coreboot, report any bugs you find, or let us know about any suggestions for improvements you have. If you have a mainboard with USB2 (EHCI-controller) you can look if it supports the Debug Port and mail the information to us, if it is not already there. If you are familiar with microcontroller development, you might be able to build a debugging tool for the Debug Port. If you are successful, we like to hear about it. Have a look at the list of open issues/bugs and try to reproduce them or (preferrably) fix them. When developing or simply trying out coreboot you always need a means to revert to your old BIOS in case something goes wrong. One way to do this is to get an extra BIOS chip (PLCC32, DIP32, DIP8, or other) and copy your original BIOS image onto that chip (using Flashrom, for example). 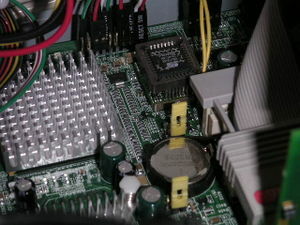 If you have a socketed BIOS (not soldered onto the mainboard), you can hot-swap the chips while your computer is running. A motherboard (or mainboard as coreboot calls it) that has a supported chipset on it. Ok... well not exactly. As long as you have the documentation for the chipset/mainboard and it's free of any NDA issues you can use an unsupported chipset/mainboard, but you have a twisty road ahead of you. And of course you need a Linux development machine. The coreboot build environment is not supported on Windows. It may be possible to do it under cygwin but nobody has tried. PLAICE (In Development) see also /.slashdot The PLAICE is a powerful in circuit development tool that combines the features of programming and emulating FLASH devices as well as high speed multi-channel logic analysis into one device. The FLASH BIOS emulator feature will help speed development of coreboot porting since the developer will no longer have to wait for either swapping FLASH devices or for lengthy FLASH programming cycles. The design will also perform as a multi-channel logic analyzer with a JAVA client. The PLAICE will make use of an adapter cable that will interface to the mainboard via the FLASH BIOS socket or onto the pins of a soldered in place FLASH device. It may also be used to program a FLASH device or emulate a FLASH device in circuit. Since the PLAICE attaches directly to the in-circuit FLASH device, the FLASH may be programmed without the need to reverse engineer any FLASH WRITE/ENABLE "security through obscurity" protection schemes incorporated into a mainboard. This board is most useful if you are working on machines from the ALIX family, but could also be useful if you can expose an LPC header on another board. external programmers are not always necessary. Use your mainboard as a programmer instead. Boot up with a known-good image, then unplug the plcc32 while powered on. Reflash that secondary piece and try a reboot. Many boards allow for more than one type of flash to be programmed, but clearly are less versatile than real programmers. A similar function is achieved by the "top hat flash" which comes at no extra cost with many Elitegroup, and some Gigabyte and Albatron mainboards like ECS KN3 SLI2 Extreme with MCP55 southbridge (which is getting severely out of stock around central europe as of 8/2007 unfortunately). After bootup, it can manually be lifted off the original BIOS chip, so the original BIOS can be reflashed after a failure. /rst is wired to /oe on the spare chip otherwise 1:1. top hat flash is equipped with a Winbond W39V040AP FWH. It may rely on particular circuitry on the mainboard to operate. Since after bootup, flash mem is not accessed anymore, you can even hot plug (plug in and out while PC powered on) push pin flashes. This way you save an external eprom programmer and mimic the procedure of top hat flash. Make sure you do not short circuit anything, though. A POST card will save your life: it's the only output device (beside beeper) you have during the boot process. The term POST means Power On Self Test and comes from the original IBM specifications for the BIOS. Port 80 is a pre-defined port to which programs can output a byte. The POST card displays the byte in hex on its 2 digit display. We use a lot of POST codes in coreboot, so if you can tell us the POST code you see, we will have some idea of what happened. If your coreboot machine is working properly, you will see it count up from 0xd0 to 0xd9 (while it is gunzipping the kernel) and then display 0x98 (Linux idle loop). There are POST cards with ISA bus, PCI bus, USB und parallel port connectors (the latter for laptops). Often they carry status LEDs for ISA/PCI signals such as: IRDY, BIOS-access, FRAME, OSC, PCI-CLK, RESET, 12V, -12V, 5V, -5V, 3.3V. Some cards were known to not function because the mainboard switches off the CLK on their slot after non-standard registration on PCI. BIOS POST card for PCI. BIOS POST card for PCI and ISA. PCI POST cards can be found in various places. See also How can I write to port 0x80 from userspace. 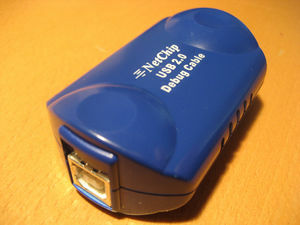 A so-called null-modem cable is used for transmitting the output from a serial coreboot (or GRUB- or Linux-) console to another computer where a terminal program (such as minicom) can be used to display/save the messages. solid state disk save time during the repeated boot process compared with regular hard disks. For hardware debugging purposes when it goes down the most atomic details. Consider logic analyzers as alternative. Should allow you to program your BIOS even if it is soldered to the motherboard. These hardware devices pretend to be an EPROM chip. An alternative to a serial console may be a USB debug device. They are not so common yet. Their advantage is higher speed than a serial console. One might hook an FPGA to it for profiling purposes or some automated checks. Accessing a USB debug device from within BIOS is not different than other USB devices, and is part of the USB standard. See also EHCI Debug Port. If the BIOS chip is socketed, it can be removed and flashed in a rom/flash burner and quickly re-installed. Some of these burners cost $1000 and more plus they complete a flash in 1-2 minutes, but if you are willing to wait 5 minutes for a flash and manually set DIP switches, The Enhanced Willem Universal Programmer will do the job for only $40-60 USD. There are several models of the Willem Programmer, each supporting many chips, but not all, so be sure to get one that supports your BIOS chip. If your chip is PLCC, you will also need a PLCC chip extractor/puller or just thread nylon string under the PLCC chip from corner to corner and yank up it straight up. coreboot v2 contains a flash utility called flashrom in the util/flashrom directory. (Old versions had "util/flash_and_burn/flash_rom" instead). OK, only ENABLING flash write, but NOT FLASHING. If neither utility supports your chip, then you could either use the DOS uniflash utility, or use its source code, which is also available for download from the uniflash site (in Turbo Pascal 7) as a reference for adding support for your flash chip to "flash_rom". Uniflash supports a lot of different flash chips, and chip interfaces. It has untested support for PCI expansion card flash BIOS, such as on RTL8139 Ethernet card (32pin DIL), which allows flashing on the NIC if manufacturer provides the circuitry. Another tool which runs in linux is flasher. Ollie Lho provided us with flash utilities for these boards under freebios/util/sis. flash_on turns on the flash write enable. This needs to be run before loading the DoC drivers. flash_rom allows you to use your SiS 630/950 M/Bs as a flash programmer. It currently supports JEDEC flash parts, AMD am29f040b models, MXIC MX29F002 models, and SST28SF040C models. Get the System Update Package directly from Intel. mcopy the ten files created from running make phlash onto the Intel flash burner disk and use the update utility to burn the BIOS. To restore the original BIOS, set the recovery boot jumper on the motherboard, put the floppy in, and it will load and reflash the original BIOS. How do I actually burn a flash ROM? Buy your favorite flash burner (we use a Needham Electronics EMP 30). Use make floppy to create the romimage and copy it to a floppy. Then use the provided software to burn the flash. Anton Borisov has released a number of tools under the GPL (v2) to extract the VGA BIOS from the BIOS ROM images provided by the supplier of your motherboard. See the Tyan S2881 Build Tutorial for more information on how to use these tools. Please check that your kernel doesn't have CONFIG_STRICT_DEVMEM set, as it will stop flashrom from working. Another poster reported that CONFIG_X86_PAT will also stop flashrom from working. Please try booting with the nopat kernel parameter to temporarily disable it.